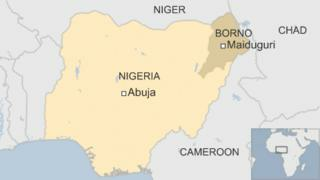 Five children, four girls and one boy, were behind a series of blasts in the north-eastern Nigerian city of Maiduguri on Thursday, sources say. Some 17,000 people are said to have been killed in that time and attacks by the group have intensified since Muhammadu Buhari became president in May, vowing to defeat the insurgents. The BBC's Abdullahi Kaura Abubakar in the capital, Abuja, says people were waiting for the final evening prayers when three suicide bombers struck the mosque. The girl carrying the fourth bomb ran off into the nearby bush where her explosives detonated, killing her. The vigilante leader was not at home when a suicide attacker struck his house, our reporter says. Witnesses and security sources said the children were aged between nine and 15. Earlier reports said all five of the bombers were girls. Our correspondent says the attacks in Maiduguri, the capital of Borno state, come as the military says it is winning the war against Boko Haram. In June, the military's headquarters were moved to the city as President Buhari wanted to centralise operations against the militants. This year, the security forces have reclaimed most of the territory captured by Boko Haram fighters and freed a number of people kidnapped by the militant group. But the boosted regional multinational force - central to Mr Buhari's strategy in defeating the militants - has not yet started operations in earnest because of reported funding difficulties, our reporter says. Mr Buhari has given his newly appointed security chiefs until mid-November to defeat the fighters, who now have ties with Islamic State group. More than 200 schoolgirls kidnapped in April 2014 from the town of Chibok in Borno state have also yet to be found.